PALESTINIAN PRESIDENT MAHMUD Abbas has apologised over alleged anti-semitic comments that drew global condemnation. “If people were offended by my statement at the Palestinian National Council, especially people of the Jewish faith, I apologise to them,” he said in a statement, days after appearing to suggest Jewish behaviour, including money lending, led to their persecution in Europe. The English-language statement added he wanted “to reiterate our long-held condemnation of the Holocaust, as the most heinous crime in history”. It did not specifically apologise for his claim about Jewish persecution. Israeli Defence Minister Avigdor Lieberman immediately rejected the statement on Twitter. Abbas “is a pathetic Holocaust denier who wrote a doctorate about Holocaust denial and then a book about Holocaust denial,” he said, citing past works that had already led to accusations of anti-semitism. His apology is not accepted. Monday’s comments sparked global anger, with the United States, United Nations, European Union and others criticising them, as well as Israeli leaders. He then cited “three books” written by Jews as evidence that “hostility against Jews is not because of their religion, but rather their social function”, adding he meant “their social function related to banks and interest”. He also reiterated claims that Israel was a colonial project encouraged by European leaders who wanted to be rid of their Jewish populations. 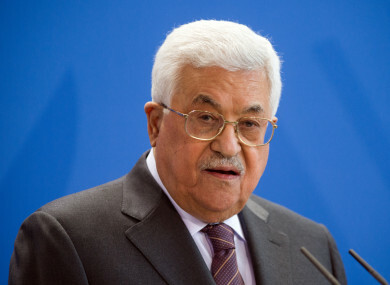 Abbas has made similar comments before but his speech at the Palestinian National Council sparked global condemnation. “Apparently the Holocaust denier is still a Holocaust denier,” Israeli Prime Minister Benjamin Netanyahu said on Twitter on Wednesday. David Friedman, US ambassador to Israel, said Abbas had reached a “new low”, while President Donald Trump’s envoy Jason Greenblatt said “peace cannot be built on this kind of foundation”. Foreign officials also said Abbas’s words undermined his call for an independent Palestinian state. United Nations envoy Nickolay Mladenov said on Twitter Abbas had expressed “contemptuous anti-semitic slurs”. Netanyahu regularly argues that the reason there is no peace between Israel and the Palestinians is the lack of a real partner for them to negotiate with. He has called on Abbas to recognise Israel as a Jewish state. The Palestinians point out Israel continues to expand settlements throughout the West Bank while maintaining a crippling blockade of Gaza. The controversy comes as the ageing Abbas sought to use the Palestinian National Council to reassert his dominance of secular Palestinian politics. Unlike his Islamist rivals Hamas, who control Gaza and with whom Israel has fought three wars since 2008, Abbas’s political grouping has recognised Israel. Email “Palestinian president apologises over alleged anti-semitic Holocaust remarks”. Feedback on “Palestinian president apologises over alleged anti-semitic Holocaust remarks”.